Nice. Gmail has already had a decent color palette for a while, but I think this one for Calendar is better. I'd like to see this Calendar version used uniformly across all Google products... included Circle labels in both Gmail and G+. Finally! As someone with a lot of calendars and who is colorblind, this is a great help. Colors has its own beauty. 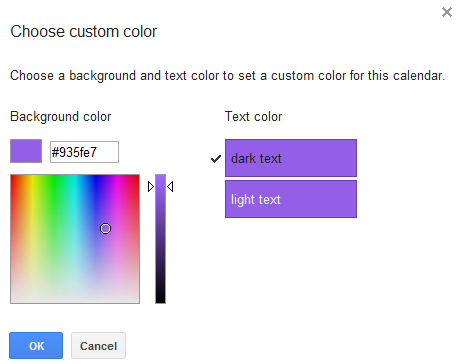 Great that google calender has now introduced color palette. And how long before Google discontinues this? It's a small update and an obvious one. It's surprising that it took this long for Google to implement it. In fact, it's been one of the most requested features for Calendar, Google said. "If your calendar ends up full of many different types of events (film nights, lunch dates, and doctor appointments, for example), there’s now an easy way to categorize them using colors," Michelle Chen, Software Engineer at Google, wrote. Such a simple change to keep a lot of people happy!! So close! Just need to be able to set the text color as well. Light and Dark just doesn't meet my particular needs. looks great and seems to be very practical. but why does a coloured background disappear when you add time to the event? instead only coloured text on a white background..
Lovely that you can customize the colour of your CALENDAR, but I want to be able to customize the colour of each EVENT. Or, failing that, at least customize the colours I have to choose from for each EVENT. Or, am I missing something! In the Chrome browser (not mobile), select your event and click "edit event". About two-thirds of the way down, "Event Color" shows several selections and the color picker. Changing the color here will change the event color box on your calendar. In the Google Calendar app, click the pencil to edit your event. Next to the event title, click the colored box to select one of twelve predetermined colors (no custom color selection appears to be available). We need to have a custom color option for EVENTS !!!! Please. Why are there more options on mobile than on desktop? It makes no sense. 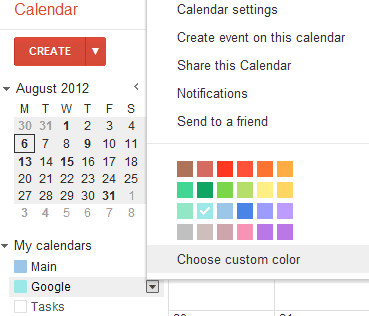 So sad that Google remowed possibility to customize calendar colors in latest update. I want it back!